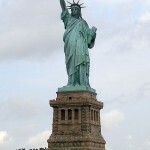 The Statue of Liberty is a statue in New York Bay. It symbolizes the welcoming of returning Americans, immigrants and guests. 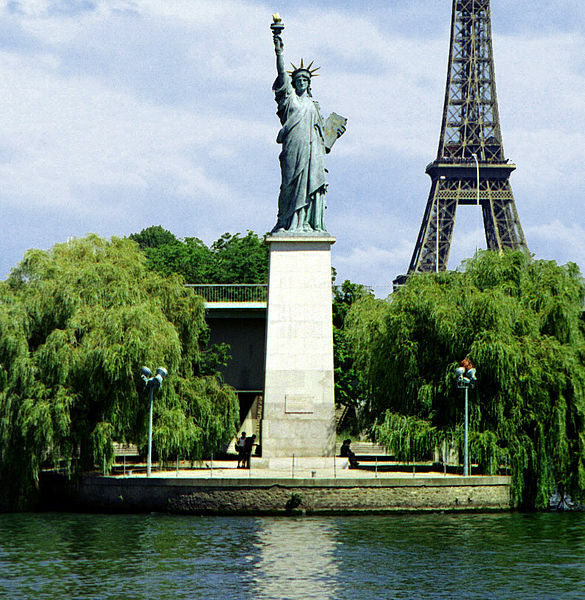 The 151 feet (46 meters) high statue (305 feet (93 meters) if the base is included) with a weight of 450,000 pounds (204 metric tonnes) was a gift from France to celebrate the centenary of the Declaration of Independence and a symbol of friendship. 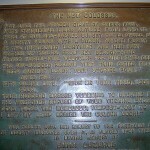 On the plaque in her left hand is written: “JULY IV MDCCLXXVI”, the date (July 4, 1776) Declaration of Independence. 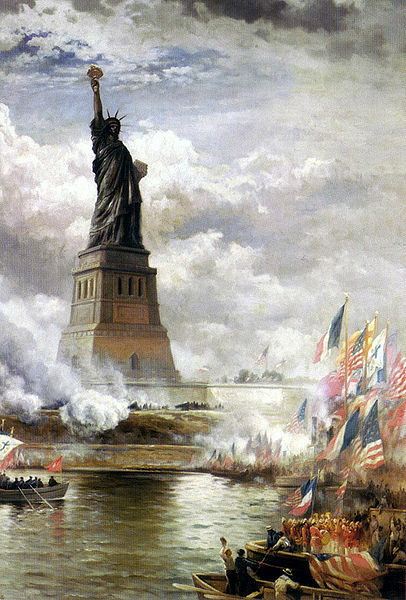 The Statue of Liberty was designed by French sculptor Frederic Bartholdi, born in Colmar, and provided with a steel structure designed by Gustave Eiffel. 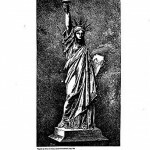 The face was modeled after that of Charlotte Beysser Bartholdi, Frederic Bartholdi mother. 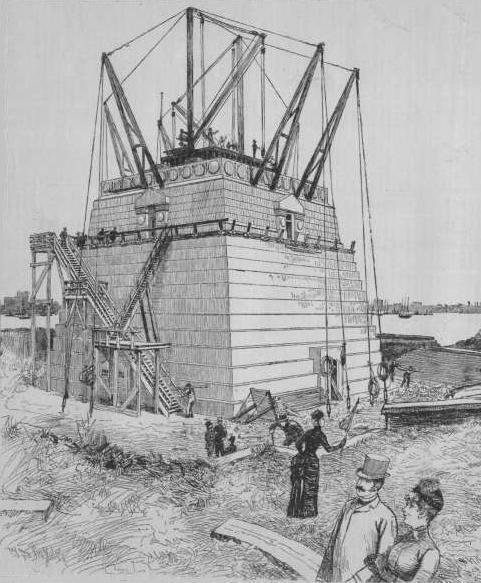 The statue was originally intended as a giant lighthouse at the northern entrance of the Suez Canal, but Egypt had no money. 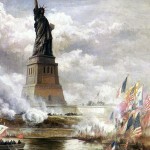 It was a present given by France to the United States and was placed in June 1886. 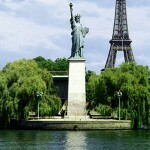 It consists entirely of copper plates attached to a frame designed by Maurice Koechlin, an employee of Gustave Eiffel. 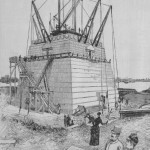 The pedestal was made ​​from euville limestone designed by the American architect Richard Morris Hunt. The crown has seven points symbolize the seven continents and seas. 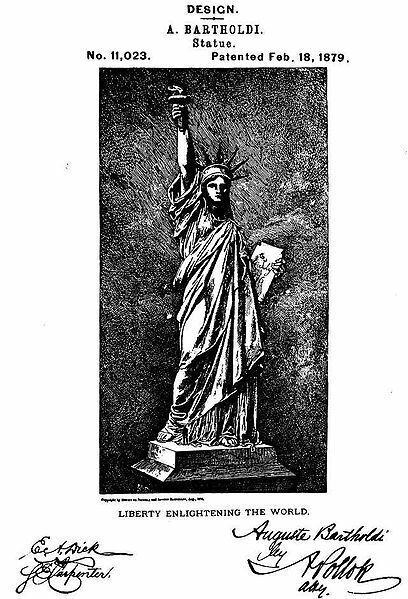 On October 15, 1924, the statue along with Fort Wood National Monument became a National Monument. 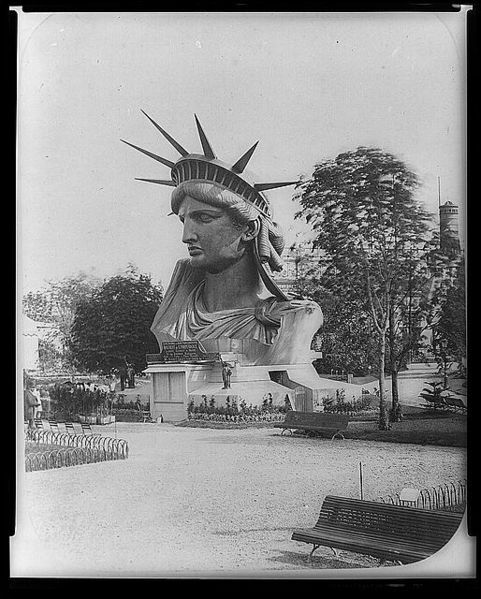 In 1935 Island Bedlou was added to the National Monument and renamed to Liberty Island. 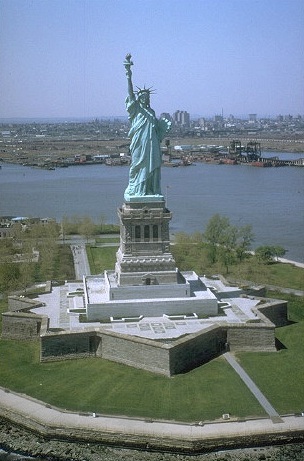 On May 11, 1965 Ellis Island was also added to the National Monument. The statue was restored from 1984-1986. During this time they replaced the 24-karat gold plated leaf flames (torch). 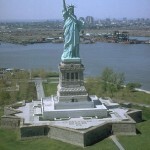 Since 1984 the Statue of Liberty is listed on the UNESCO World Heritage list. 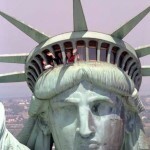 After September 11, 2001, the statue was closed for some years to the public. 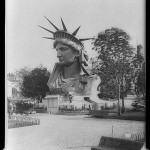 In 2003 the 118 years old monument was restored and renovated again, especially for the safety of visitors and enhance the preservation of the statue protection. 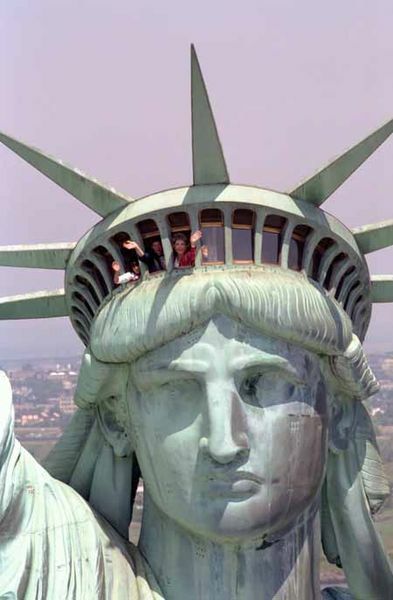 Since summer 2004 the Statue of Liberty is open for visitors again. 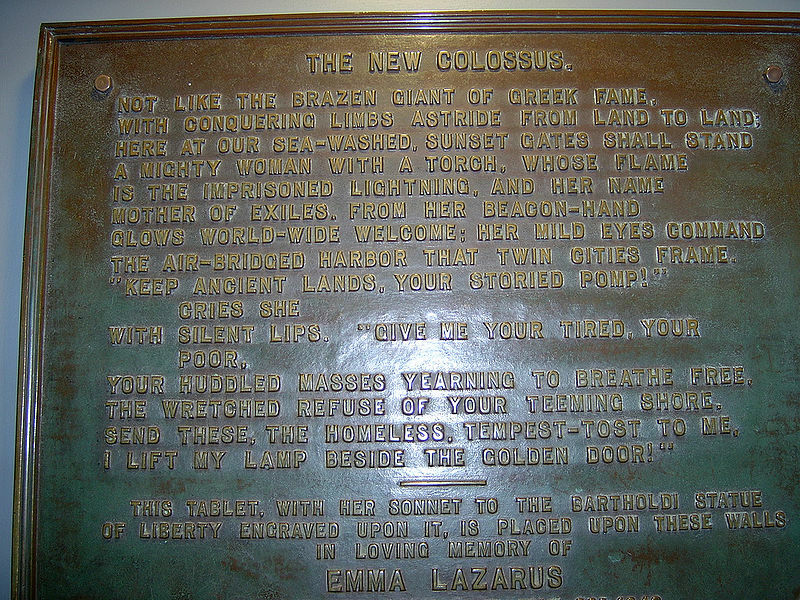 There is a ferry from Battery Park on the southern tip of Manhattan to Liberty Island, the island on which stands the Statue of Liberty, and to Ellis Island, where the arrival halls for immigrants can be seen. 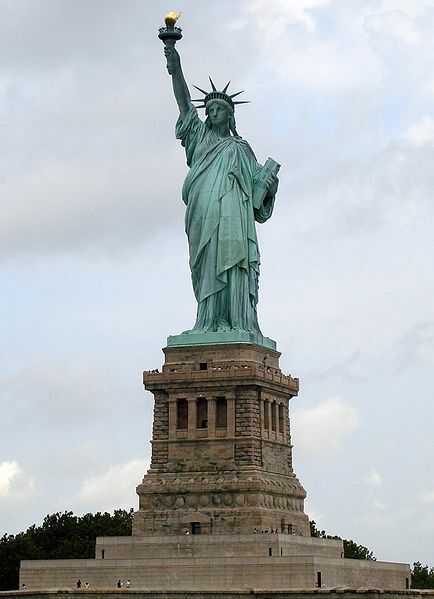 On Independence Day (July 4) in 2009 the crown of the Statue of Liberty reopened to the public for the first time since September 11, 2001.